We asked our Facebook friends to nominate things that can't be found in London, which they wish could be found in London. As ever, we tried to get at least one suggestion for each letter of the alphabet. Here are our 26 favourites. Check out the Facebook page for further trivia. B = Bike lanes — proper ones, like in Holland and the Nordics (Tytti Laine) And, lo, the mayor obliges. M = Mexican food (Lilja Kupua Addeman) Surely there must be at least one good Mexican? Readers? N = No elephants! (Neil Hickman) Um...? P = Pavements that digest chewing-gum (Olga Sidoryk) What if they malfunction? X = Xylophone footpath. So when you are on your way to work you can make sweet music with your fellow londoners! (Stacey Emiliou) Perhaps as a lasting legacy to the work of Patrick Moore? 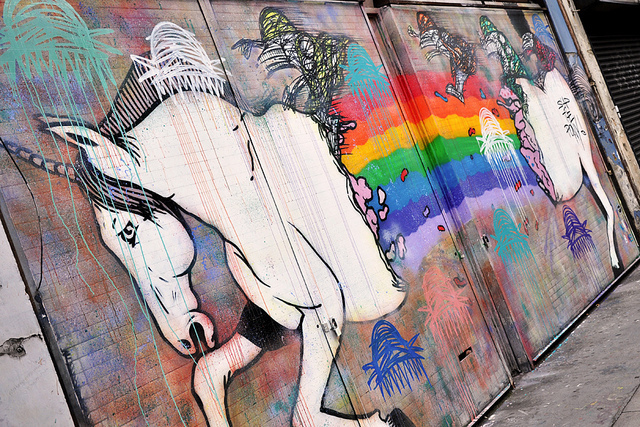 Image of a unicorn on Commercial Street by Iris Jones in the Londonist Flickr pool.